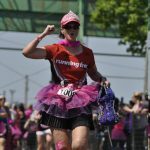 The Chilly Half Marathon is my go-to spring event; it was my first half marathon, and I have run it several times since. It takes place annually in early March, so it is good incentive to train through the cold, long winter! Organized by VR Pro and held on the streets of Burlington, ON, the Chilly Half is an out-and-back route that follows the shore of Lake Ontario. It is relatively flat, and a very enjoyable course with lots of spectators and community support. There is no race day kit pickup which makes things difficult for out of towners, but that is this events only downside. Before and after the race you can keep warm inside several buildings, and after the race most of the bars and restaurants in the downtown area are open to provide you with your post-race treats: A pint of Steam Whistle beer and a bowl of Stagg Chilli! Your race swag also includes a beautiful New Balance 1/4 zip long sleeved fleece top and the medal is always big and fun. As a first half marathon or as a great start to the race season, I highly recommend the Chilly Half Marathon.